Alaska Real Estate News, Valley Market Real Estate / For Buyers / Alaska Land, How Much Do You Want? People moving to Alaska from Midwest states usually want a house with some “land”. By that they mean they want to have at least 5 or 10 acres along with the house. They are always surprised to find that is very hard to find “land” in the Alaska. Alaska has more land by far than any other state in the United States. It is more than twice as large as Texas, but only about 1% of the land is privately owned. 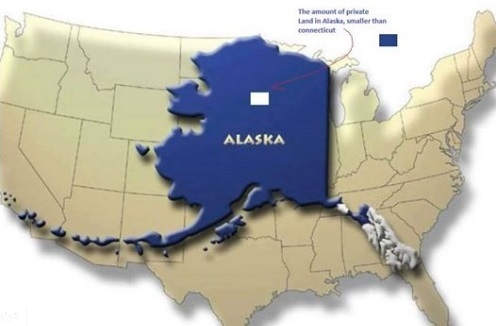 Actually more than that is privately owned if you count the huge expanses owned by Alaska Native Corporations. For example, Doyon Ltd., one of 13 regional native corporations, owns 12.5 million acres by itself. There are many smaller village corporations that also own large tracts of land. In general, they aren’t selling. The land is their heritage and they are keeping it. The Federal government and the State government own the rest of the land. Most of the Federal land is National Parks, National Forests, or Wildlife Preserves. The state owns a lot of land and does sell it in a very slow and methodical manner. That leaves the rest of us on less than 1% of the land. That means about 3,750,000 acres are privately owned. That’s quite a bit less than the size of the State of Massachusetts. Couple the small amount of private land with the fact that the transportation and electric utility grid in Alaska is extremely small, you reduce the available land even further. People don’t realize that Alaska is still a pioneer state. Most of the state is not reachable by road vehicle. I don’t care how good of a 4X4 you have, you can’t drive there. And then, there are a lot of places you can drive to, but you can’t connect to power once you get there. So, you have a choice. You can buy a lot of land out in a remote area, set up a tent, and commute by plane, you can pay a high price for the few available pieces closer in, or you can settle for a smaller parcel. Most of us choose the latter. We actually want to be able to afford a house with our land so we end up settling for about an acre of land. But just think….our acre of land is only 10 minutes or so from Alaska!